Some of the region’s biggest employers have been urged to take advantage of the apprenticeship levy, which comes into force in later this year. Representatives from more than 40 local businesses – including Hitachi Rail Europe, Gestamp Tallent, 3M, GSK, Nifco and Ebac – attended a specialist employer event focusing on the levy at South West Durham Training (SWDT) on Aycliffe Business Park. County Durham Engineering and Manufacturing Network director of operations Ben Gilhespy, who spoke at the seminar, warned attendees that the so-called skills gap is actually worse than how it’s currently perceived. “We keep hearing people talk about a skills gap for our 16-24-year-olds, but it’s not actually true – it stretches right throughout our businesses,” said Gilhespy. “One of the key areas we’re looking at for particularly SMEs in the county is succession planning, which is really important. “People at the top can’t move on without having people beneath them with the necessary skills to move up. “We’re producing hair dresser after hair dresser because we think we need them, but we need the business community to interact with our training providers so our educational establishments understand what the needs are out there. Former Ebac managing director Pamela Petty, who’s now chair of the Bishop Auckland College board and a director of Aycliffe Business Park Community, also spoke at the event. “Absolutely everyone has the ability to learn and the ability to make a difference. They’re good for both the apprentices and employers – it’s a win-win situation for me. “One of the good things about the levy is that there’s actually more funding available in the new system for us older people, and it’s not just about 16-year-olds any more. “There are opportunities for people within companies now who have a really good attitude and an understanding of the business to upskill themselves, and employers can only benefit from that. SWDT chief executive Lee Childs sees the changes as an opportunity for businesses to upskill their existing staff. Childs, an engineer from Shildon who served his time with SWDT 16 years ago and who took over as chief executive in October 2015, said: “The apprenticeship reforms might seem quite daunting to employers, there are a lot of changes that come into force from April this year. They’ll have to handle a digital account and manage their levy pot, for example. SWDT last year welcomed new apprentices from Hitachi Rail Europe and 3M in Aycliffe, Darlington-based Cummins, Stockton-based car parts maker Nifco and Barnard Castle-based pharmaceuticals giant GSK. All are on engineering or manufacturing programmes with bespoke elements required by their employer, including hydraulics, pneumatics, electrical, fabrication and welding. 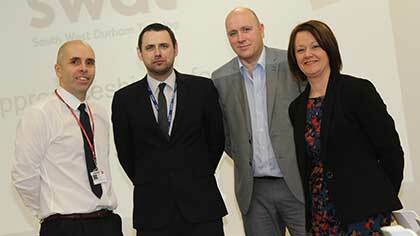 SWDT, a subsidiary of Bishop Auckland College which employs 27 staff, celebrates its 50th year later this year.